So What More Can You Tell Us About Auto Wraps? What is a vehicle wrap? Is it paint? A vehicle wrap is the application of a high performance; large-format, digitally printed vinyl that adheres to your vehicle’s painted surface. What this means is that you can put virtually any photo or design that you would like on the side of your vehicle. How is a vehicle wrap different than paint? Paint is permanent. Vehicle Wraps actually protect your cars painted surface, and can be removed when it comes time to trade-in, or sell your car. In addition to being wrap installation professionals, we are also capable of removing the vinyl from your vehicle, should the need arise. Will a vehicle wrap harm my vehicle’s surface? A vehicle wrap protects your paint from the harmful effects of Mother Nature. In addition to UV protection, the vehicle wrap will stop chips, scratches, acid-rain and more, and since the vehicle wrap is not permanent, your paint will look just as pristine as it did the day you dropped your car off to be wrapped. The benefits are two-fold, you will be adding resale value to your vehicle, all while promoting your business. Mild soap and water will do fine. We do recommend that the vehicle is washed regularly, as road grime can cause vehicle wrap fatigue and negate the vinyl manufacturer’s warranty. Compared to other options for advertisement, vehicle wraps offer you the most exposure for the least amount of money. It has been said that over the course of a year, if you live in a city of 50,000, your vehicle wrap will receive 8.3 million impressions.On average a small mid-sized car, such as a Honda Accord will cost $2000 to print and install, a mid-sized car will cost approximately $2450 with design, and an SUV or Truck would be between $3000-$3500. Please keep in mind that this does not include design costs. Compared to radio, or television advertisement, the impressions to cost ratio is significantly lower. The short answer is 2 weeks, however we make every effort to keep our clients happy, so if your needs are a bit more demanding, we are confident that we can meet your stricter requirements. In general it takes a week to flush out the design phase, a few days to print the graphics, and 2 days to install the wrap. How do you handle wrapping windows? What size vehicles can you wrap? The answer to that is simple, we can wrap any vehicle. We are wrap professionals; we can wrap something as small as a sub-compact and motorcycle, all the way up to a bus, plane, train or monster truck or building. That is the beauty of auto wraps, the sky is the limit. How cost effective are vehicle wraps? Studies conducted; state that in a city of 50,000, a business with a vehicle wrap will get approximately 8.3 million impressions. Since an average vehicle wrap costs $3000, that is a significantly large impression to low cost ratio. How long will the vehicle wrap last? LSW uses a high performance vinyl, with a manufacturer’s warranty of 5 to 7 years under normal weather conditions. That being said, as long as you keep up with washing your wrap (just as you should your vehicles painted surface), the wrap should last a minimum of 5 years. • .tif, .psd, .jpg – these bitmap/raster files must be an exact dimensions of the vehicle and cannot have a resolution lower than 150dpi. We prefer to have a layered .psd file with the text layers rasterized. You can take your wrapped car through a car wash, we recommend this, as your vehicle needs to stay clean so that road grime and debris does not contaminate the vehicle wrap. We do not however suggest using a pressure washer, as this could possibly lift the edges on a vehicle wrap and present areas of failure later on down the road. What are the other services Lifesize Wraps offers? In addition to vehicle wraps, we offer wall murals, window graphics, floor graphics, refrigerator wraps, vinyl on countertops, the possibilities are endless. Vinyl will adhere to most smooth surfaces. 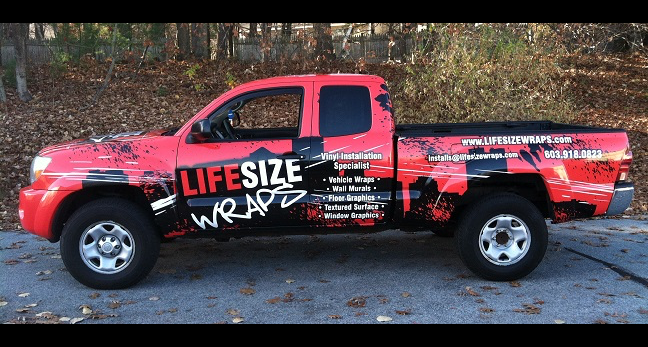 For more information about any of our services, please contact us at 603-918-0823 or email us at installs@lifesizewraps.com.